Most of this one made it in, barring the last couple of sentences. Again not online. History was made at Henley Royal Regatta yesterday when Dutch students Nereus obliterated the Temple Challenge Cup record, taking a staggering nine full seconds off it while beating Oxford Brookes University by a mere six feet in one of the regatta’s most competitive events. Rowing records usually fall by a second or two, but a combination of a light tail-wind and zero stream put both crews well inside the previous mark as they battled along the Enclosures, filmed by a drone camera capturing stunning footage of Friday’s races. No UK eights now survive in the Temple, after University of London lost to Cornell’s lightweights. Five other crews set or broke records yesterday, including Nereus’ Prince Albert coxed four, and Sydney’s Visitors’ coxless four. South Africa’s reigning Olympic and world lightweight champions James Thompson and John Smith equalled a formerly heavyweight Barrier record for the Double Sculls, while Glasgow Academy rowed through to beat Sydney’s junior scullers in a course record for the Fawley Cup, taking one second off the time equalled a few hours before by Sir William Borlase. The national minute’s silence was held at noon, when thousands of spectators stood to remember the victims of the Tunisian shootings. Single sculler Genevieve Bailhache-Graham was still trailing Olympic and Henley champion Mirka Knapkova as noon struck, and composedly sculled over the line in complete silence before bowing her head in her boat. Princeton and Sport Imperial were forced to make last minute crew-changes as a result of injury, which in Imperial’s case turned into a nightmare situation. Lacking their usual substitutes, who are away in Germany, Imperial were forced to draft in Fred Vystavel, a full member currently studying in Princeton and racing in their Ladies Plate B crew, when their usual five-man Geordie Macleod woke up with back pain. However, a complaint was made that Vystavel as a junior varsity oarsman was ineligible to race in the lower-standard Thames event, a point upheld by the Stewards. Sport Imperial could not race, and the decision handed their opposition, the impressive University Barge Club from Philadelphia, a very easy day paddling over. Princeton’s B-crew stroke man, former junior international Julian Goldman, had to race the 2112-metre course twice, the Princeton Ladies’ Plate ‘A’ crew stroke also out for medical reasons. Goldman’s B crew were flat out unsuccessfully trying to get on terms with Leander in the morning, before Goldman stroked the A-crew against undisputed US champions Washington six hours later. The Princeton Tigers manfully held the Huskies level to halfway, but could not quite match their power. A mishap was narrowly avoided when an umpire’s launch, which had accidentally entered the course while the crews were mid-race, backed rapidly off again in front of a full grandstand of spectators. The Princess Elizabeth schoolboy eights started to get interesting as Eton College lost by a length to Gonzaga High School, the Americans managing to match Eton’s pushes to stay ahead. That puts Gonzaga up against Westminster, who beat Andover by a similarly narrow margin, while St Paul’s and Radley race the other semi-final. Today the British national eight is in action against Australia, an unknown quantity as they have not raced yet this season. This is the piece I had in the Friday Telegraph, again not online (see earlier posts). The Red Arrows flew across Henley Royal Regatta in dramatic fashion before lunchtime yesterday, but the roar of jet engines did not faze the junior scullers of Pangbourne College, who were racing Y Quad Cities at the time. The result, a two-thirds of a length win to Pangbourne, was one of a handful of close races on the second day of the regatta. A gusting cross-wind threw several steersmen off their game, their errors being caught on camera for everyone to see in this first year of live online streaming. The worst culprits were Ruderverein Münster, whose Visitors’ Cup coxless four veered sharply across the course as soon as they started, colliding with Harvard University’s ‘A’ crew and stopping the race. Steering was little better on the restart, Münster being repeatedly warned until Harvard, who had calmly rowed straight on, put in a push at Remenham which brought them through the erratic Germans and to a clear-water win. Later on in the same event Eton Vikings and Griffen hit the wooden course-edge booms at Temple Island, allowing Yale University to row away. The shock result of the day was a victory for Boston College High School over the Canadian schoolboy champions Shawnigan Lake, who led at first but were soon rowed through by the Americans. Other comfortable winners in the Princess Elizabeth Cup were Radley and Westminster, while there were verdicts of less than a length for US crews Gonzaga and Phillips Andover. Eton were pushed relatively hard by Salisbury School, who had lost two crucial oarsmen who had to start their naval cadet training. Another upset came in the Thames Cup, where Thames Club ‘B’, having put out selected crew Tideway Scullers the day before, defeated a new crew from 2014 champion club Upper Thames by a length. Today the London club meet Leander’s Star and Arrow journeymen, who managed to cling on for a half-length win against a spirited assault from Agecroft. In the bottom half of the event lurk Americans University Barge Club, who posted a Barrier time only three seconds off the record, albeit in the best conditions of the day. The Temple student eights are shaping up for some hefty fights today, as holders Oxford Brookes meet perennial Dutch rivals Nereus in the top half of the draw, and Princeton’s third varsity eight meet Lyon in the other half. Headington and Y Quad Cities won the opening heats of the expanded Diamond Jubilee junior women’s quads. Today the senior women’s events begin, and the internationals join the small-boat events, including European champions Matt Langridge and James Foad in the Goblets pairs. The high-quality Ladies’ Plate event for elite eights also starts, featuring an east-west match-up between Princeton’s Tigers and the Huskies from University of Washington. My piece as submitted to the Daily Telegraph, which went into today’s print edition but not online. They tweaked the starting paragraph a little, arguably for the better. Spectators sweltered at Henley Royal Regatta yesterday, as temperatures by mid-afternoon became hotter than both Barcelona and Cairo, and ten spectators collapsed in the burning sun after lunch. The traditional heatwave announcement “Gentlemen may remove their jackets” had been made before noon, but by late afternoon six spectators had needed intravenous fluids to rehydrate and cool down, the medical team took an emergency loan of one of the physiotherapy couches, and the enclosures had run short on chilled champagne. Despite long periods spent waiting in the full glare of the sun before the start, no rowers collapsed on the water, and only two needed to have minor first aid treatment after their races. The worse accidents were to their equipment, members of two different schoolboy eights finding the spoon at the end of their Wintech-made oars suddenly dropping off as they rowed along, a phenomenon put down to the glue melting in the heat. Canford School were the first victims, losing a spoon just before their morning race against Latymer Upper, which was then postponed, Latymer winning later on. Three hours later the stroke of King’s School Canterbury found his spoon dropping off while his crew was already trailing British national champions Westminster School by two lengths. 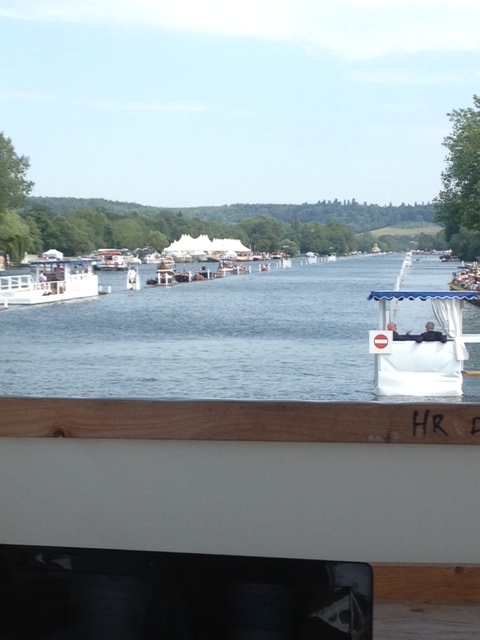 A tougher problem faced several crews who have been trying to transport their boats to Henley from the continent this week and found themselves blocked by the strikes. Those with delayed trailers included the Canadian women’s eight, who race Imperial on Friday, and Ratsgymnasium Osnabrück, who had to borrow the boat intended for Shrewsbury’s alumni crew to do a row-past on Saturday, but still managed to beat London Oratory by three lengths. The new YouTube streaming coverage was a huge success, the regatta’s website receiving more hits in one day than in the whole of last year. It gave ring-side seats to thousands watching the most exciting race, in which Upper Thames’ Wyfold Cup coxless four was rowed through by the better-steering Tyne Amateur just before the line, for a verdict of two feet. A roster of top rowing commentators broadcast from Sir Steve Redgrave’s office at the regatta headquarters beside Henley bridge, and a catamaran zoomed beside the first minute of each race. At the start of the day Thames Rowing Club had four crews in the club eights. By the evening this was down to two, but not for want of trying. Drawn against the more powerful Kingston, Thames ‘D’ manfully held them to a canvas (six feet) gap, until they caught a lump of water two-thirds of the way up the course and Kingston pulled away. Kent School’s American juniors, pushed into the adult eights as a result of two boys having their nineteenth birthday during June, managed to overturn Newcastle University’s second eight, while Liverpool rowed through University College London. The junior men of Y Quad Cities, an American club from the Mississippi making its first appearance at an overseas competition, rowed through early leaders Kingston in the Fawley quads event. Their junior women, who are US national champions, race on Friday. There were few steering disasters despite a cross-wind which at times became strong gusts, but one pair of Wyfold coxless fours found it tricky, Henley and Oslo clashing in neutral water early on and having to restart for an eventual Norwegian win. Today thunderstorms threaten the racing programme, which must be suspended if lightning approaches. At least thunder might scare the waterfowl: at one stage three different boats had to be pressed into service to herd flocks of forty or more geese away from the race course. This is the piece I filed for publication in today’s Telegraph – it was mostly used (barring the last three paragraphs of competition preview) in the print paper today. Not online because according to the editors, rowing’s not interesting enough to enough people. A bumper crop of 526 crews entered Henley Royal Regatta, which starts tomorrow, in celebration of two major changes to the event. Olympic rowing legend Sir Steve Redgrave has taken over from Mike Sweeney as chairman of the illustrious event, and for the first time this year those who can’t reach the regatta will be able to watch racing live on the internet and the BBC. Henley Royal has been televised before, with the BBC last taking live footage in 1968, and ITV some highlights in 1976, but limitations in technology made the expense too high. Since then the problems had been considered insuperable, but a team led by Stewards Neil Chugani, Sarah Winckless and Sir Matthew Pinsent has developed a system of 10 cameras and modern streaming technology which will broadcast all racing live. It will be streamed on a dedicated YouTube channel throughout the regatta, with a highlights programme added each evening. On Sunday the finals will be broadcast live on BBC Online and via the red button. The rowers this year come from 18 countries and include a record American entry of 59 crews. Amongst the titans defending 2014 titles are scullers Mirka Knapkova and Mahe Drysdale, while the British team has entries in all seven of the open events. They are headlined by the GB men’s eight, who have now been joined by Constantine Louloudis after his final exams, and are starting their charge towards winning a third world championship title running. Matched against Australia on Saturday, the Brits are expected to reach Sunday’s final against Olympic champions Germany, whom they beat by 0.3 seconds in Varese 10 days ago. Wednesday opens the racing with the big-boat events for clubs, students and schoolboys. Most of the strongest US student eights are in the Ladies’ Plate, which begins later in the week, so Temple Cup holders Oxford Brookes are up against a slew of lightweight American crews, along with French students Lyon, and in the same quarter of the draw, the ever-dangerous Dutchmen Nereus. The Thames Challenge Cup for club eights lacks last year’s winners Frankfurt, but has two German entries and top clubs from three continents, including Australians Mercantile and British high performers Sport Imperial. Thames Rowing Club itself managed to qualify no fewer than four eights for the event, and its lead crew has its best chance of a victory for many years. The two junior events starting on the first day are the Princess Elizabeth schoolboy eights and the Fawley quads. National Schools eights winners Westminster have last year winners Eton and Americans Phillips Academy in their half of the draw, while runners-up St Paul’s have been landed with the hardest race of the day, a battle against Abingdon, who were four places behind them at National Schools, and later on could face Canadian champions Shawnigan Lake. The top crews in the Fawley do not start until Thursday. Sitting in the press box at Henley Royal (glorious day, nice sharp breeze to offset the hot sun) and I’m asked the question “why wasn’t your Telegraph coverage from this morning’s paper put online?” The short answer is ‘lack of reaction’ and if you do nothing else after reading this blog, please go online and like/favourite/retweet/comment on something in the national press to do with a minor sport, ideally rowing. Doesn’t matter which paper, doesn’t matter whether it’s favourable or rude, but do it if you want the papers to continue being interested in the non-lucrative sports, because they’re rapidly dying out. One problem with the difficult issue of print newspapers is that they’re still trying to work out how to keep a business model going in a world where nobody wants to pay anyone to publish written coverage. Advertising simply won’t ever pay for everything, yet when people are asked, they do want to retain newspaper-style reporting. However, the same readers who will shell out £50-odd per month for Sky TV and broadband, who will buy bells and whistles for their racing bikes, triathlon suits, and download apps and music tracks for 99p a time, jib at paying either online or offline to read what a sports (or indeed news or politics) commentator has written about something they follow unless it’s one of those sports where there is loads of money slushing about. So, a few months ago the Telegraph sports desk had a policy change, and now they have tightened up the online edition so that it doesn’t have everything in. It will only carry sports stories which are gauged to be of interest. This makes for a tricky vicious circle for rowing: they think nobody’s interested, so they won’t publish online, therefore robbing us of the chance to react and show we _are_ interested, therefore reducing the chance that rowing will in future be taken online, let alone in print. I think I’ve had a couple of dozen pieces online this year for the Telegraph (see this link for most of them), and I can count the total number of comments for all of them combined on one hand. Doesn’t matter whether they are complimentary or nasty, it’s the reaction which counts when editors are trying to work out what readers want to see. Page views count for nothing. Ignore the fact that rowing has been published, and you knock another nail into its nearly-complete coffin. I’ve blogged about this before, but it doesn’t do any good. Given that I’ve asked but it looks unlikely the Telegraph will put my morning piece up, I’m going to publish it next. I’m going to tweet the link, and include the Telegraph twitter handle. I hope someone reacts, because otherwise they will think we just don’t care. We’re already down to minimal newspaper rowing coverage – we have to fight to keep the rest, or lose it.